Somehow amidst diaper changes, bedtime stories, and wrapping up final client work before the break, I managed to assemble what I’m generously dubbing “The Official Social Media Guide to Thanksgiving.” Nothing scientific here – just a fun, insight-rich skim across search and conversational venues. Interestingly, much of what I discovered amounted to “good ol’ fashioned” traditional media content – e.g. a TV clip on YouTube, or a NY Times Thanksgiving review – fortified by comments, ratings, and even the occasional “video response.” Put another way, the power of “conversation” took ordinary content and made it (in most cases, at least) extraordinary. Will update this list via Twitter. How can we not start here? This is the ultimate “cheat sheet” for every well-meaning parent or Thanksgiving aficionado. Did you know Alexander Hamilton proclaimed that no "Citizen of the United States should refrain from turkey on Thanksgiving Day"? A few fun stats and charts courtesy of the never-quiet blogosphere. 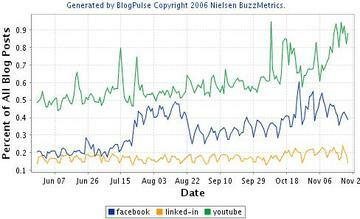 Most of these charts are sourced from Nielsen’s BlogPulse, which tracks 90 million blogs daily. Who needs to visit Plymouth Rock when thousands of FlickR users are capturing every possible angle, perspective, or wee-small indentation in the famous (albeit somewhat underwhelming) landmark. Saves a wee bit on the travel budget in these tough times! Of course, if you are bored or lonely or need some form of conversational stimulus, there’s no shortage of Thanksgiving talk on Twitter. I counted 490 references in a ten-minute period last night. From the instructional to the mundane to the outright insane. Why do we do this? An Emmy winning writer, producer, Levin produces a terrific list of Thanksgiving travel holiday tips. Practical, spot-on, and humor-laced advice – I’m sure millions can relate. By the Washington Post This two year old video on YouTube, originally sourced by WashingtonPost.com, has the highest “view count” and it’s quite good. The comments affirm its popularity. By Bill Cosby (Impersonating Julia Child): Fun interplay between father and son in the subtle nuances of cutting a cabbage substituting as a Turkey. Cosby also does a mean impersonation of the late foodie Julie Child. Deep Fried Turkey Video Cooking Demo: OK, I’m biased here because Jim Lites, the content contributor, is one of my best friends, but if you are serious about pushing the limits of how you cook your bird, this is worth a review. Warning: this does take a bit of extra time and prep, and no shortage of oil. Organic Turkeys and Green Thanksgiving Prep (at a Price?) – NY Times: For the “aspirationally-green,” this is worth a skim, and the comments are also rich with insight (or economic warning). Another good example of how the traditional media “fortifies” content with conversation. My friends at the BBB recently launched a section on Facebook (and other places) offering consumers and small business a host of "video tips" (aka "Scam Grams') on a host of shopping issues. Some of this could also come in handy with Black Friday coming around. This is a well-written, personal reflection on Thanksgiving dinner – representative, one presumes, of millions of personal “dinner table” narratives that will likely spill onto blogs and personal paged in the hours and days following the big meal. The Story of Thanksgiving by School House Rock: A quick, oversimplified – yet hum-worthy – three minute history of the Pilgrims coming ashore! Who can’t get excited about School House rock! The comments are fun too! I feel like a bit of an imposter here at BlogWorld. I talk about blogs every day -- interpret them, offer strategy to companies about how to create and manage them - but in many respects I've lost touch a bit with "individual" blogging. The reality is that I'm only updating my ConsumerGeneratedMedia site one every week or so (sometimes longer), and many of the issues or tips or "deep thoughts" I ordinarily would toss on my blog have been cannibalized by Twitter, Facebook, Yammer (internal twitter), and the bi-weekly "marketing meets service" column I now write for Advertising Age. I'm also increasingly self-conscious that if I don't stay diligent, and ever attentive, I'll continue getting lapped by far wiser and prescient marketing industry bloggers. There are many, and they keep me on my toes. 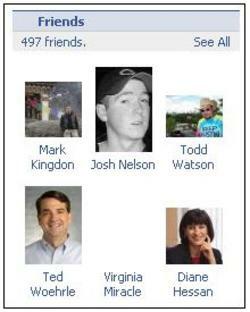 The Facebook "500 Friend" Tipping Point -- Too Much? I'm flirting with 500 friends on Facebook? The question is: how much is too much? Is there a "point of diminishing returns" in how many folks I friend? How do I sustain the conversation among friends in a meaningful way? What is friendship? These are the big questions I'm asking as the I reach the 500 mark. Check out the burst of online conversation on blogs in the final hour of this evening's Super Bowl. 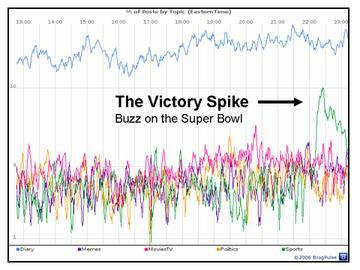 The green represents discussion deemed to be "sports" oriented, and it's clear that most of the spike you see is attributable to the final moments of the Super Bowl. 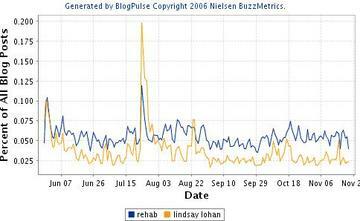 This is taken from Nielsen's BlogPulse tool, which monitors over 70 million blogs every day. 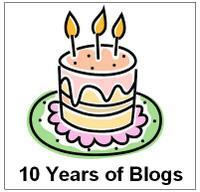 10 Year Anniversary of Blogs: Time Flies When One's Overwhelmed! A few minutes ago my colleague Jon Gibs forwarded me a BBC article noting that today the "word 'weblog' celebrates the 10th anniversary of it being coined on 17 December 1997." Unbelievable! Has it really been 10 years? Now, in fairness, lest anyone be deluded into thinking I was on top of this mega-trend back in 1997, let me admit up front that I just didn't have an early clue about any of this until about five years ago. And the real tipping point, I will admit, came when I impostered my way into an intimidating (yet unmistakably stimulating) A-List blogger event on November 6th 2004 entitled BloggerCon, organized by the likes of Dave Winer and held at Stanford University. Although I already had a blog dedicated to my Hybrid Car experience (HybridBuzz.com), and our pre-Nielsen company Intelliseek had already created a blog portal known as BlogPulse.com (a perpetual thanks to then-employees Natalie Glance, Matt Hurst, and Sundar Kadayam for pushing us hard in that direction), I learned quickly at this "don't talk unless you have credibility, passion and authority" conference that I was barely scratching the surface of what the blogosphere was all about! I'm still scratching my head, but I do know this: the blogosphere is at the heart of the unprecedented changes taking place in media and communication today. Yes, there's hype, and I've written about this plenty, but with the blogs has come an unmistakable, largely bottons-up publishing revolution, and we're continuing to feel their impact across all levels of communication: consumer, corporate, media, and beyond. The blogophere has also laid tracks and runway for CGM2 (consumer-generated multi-media), social networking on platforms like Facebook, and an unmistakable (and long-overdue) corporate "reset" in thinking about relationship marketing, conversation, consumer relations, and of course -- my favorite topic of all - customer service. And so yes, a "Ten Year Anniversary" certainly worth celebrating. Every month or so Peter Kim publishes a list of top marketing blogs entitled the M20. Somehow I've managed to consistently make the list (which makes me scratch my head a fair amount) but there are a host of other excellent blogs that cover similar themes and issues. This week he was a bit more generous in his link-love, and I've basically lifted his expanded list of highly readable blogs written by marketing executives. See below. More background on Peter's approach here. Sometimes you just need let the numbers tell the story. I'm beginning to pull together various notes and conclusions from 2007, and in the process ran a series of trend charts on BlogPulse.com. This tool charts out the number of references against a given term or phrase among total new blog postings. 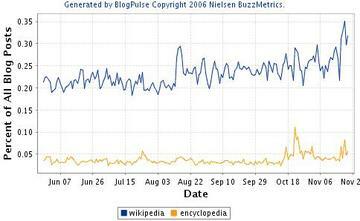 Nielsen's BlogPulse tracks about 66 million blogs, and roughly 700,000 new posts are indexed every day. Here's a shortlist of buzzmakers for the year. Wikipedia Still Trumps the Encyclopedia: The meteoric rise of Wikipedia.com continues to fascinate me (and many others, obviously). This form of "group CGM" continues to nurture trust and credibility across the web, and the number of blog links into Wikipedia punctuate that point. Who would have imagined, only a few years ago, that quirky sounding utility like Wikipedia would draw over five-times as many references online as the ostensibly durable term encyclopedia? Go figure! Facebook Takes a Leap, YouTube Keeps Marching: As conversation goes, Facebook has jumped well ahead of peer social networking sites, especially Linked-In, and I suspect much of this stems from both the open-sourcing of application development on the platform and the hardly veiled discovery, if not embrace, by the marketing community. Of course, these numbers may under-represent the true level of discussion about Facebook because most Facebook conversation is taking place on, well, Facebook, not just blogs. My own Facebook group , Consumer Generated Media, quickly grew a membership base that now exceeds email subscribers to this blog. YouTube, meanwhile, continues to burrow itself even deeper into the conversational vibes, aided by user growth, many tipping points of critical mass, increasing diversified content, and aggressive marketing by just about anyone who puts up a video, including marketers. 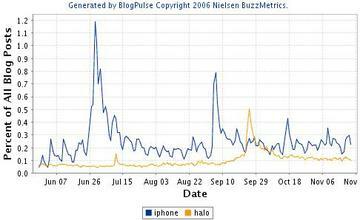 Iphone Creates a Buzz Halo: But the Real Halo Also Impressive: Unless there's a big surprise between now and December, it will be difficult to dethrone the iPhone as 2007's biggest buzz story. The buzz was strong, sustained, and diversified, which in turn kept the popular device always conversational. Meanwhile, "Halo 3," designed by Bungie Studios for Microsoft's X-Box, also has been a big CGM winner this year, peaking shortly around its release on September 25. Sample the conversation. 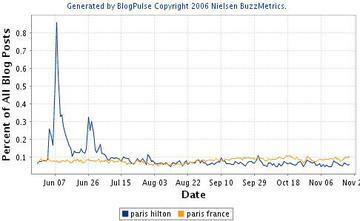 As Buzz Goes, We'll Always Have Paris (Hilton, not France): Not sure if this is the best news for the French tourism bureau but Paris Hilton kept pace with overall buzz that explicitly referenced Paris, France, and even far exceeded that during the ubiquitous celebrity's more controversial moments. It's hard to say whether any of this will die anytime soon. You can peruse her HeyNielsen conversation to understand some of the root drivers behind her often-polarizing discussion. Her David Letterman appearance probably takes the cake in terms of elevating her buzz levels above the competition out there. Steroids Buzz Bonds to Barry Bonds: Guilty or innocent, Barry Bonds just couldn't dodge the vast majority of conversation on blogs related to steroids. 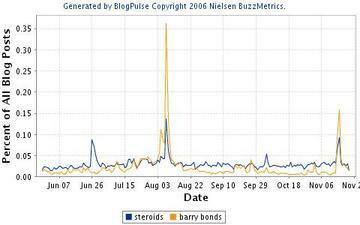 Where buzz about steroids spiked, conversation about Barry Bonds was even higher. The only exception was around late June, when steroid related conversation spiked related to the death of professional wrestler Chris Benoit. Rehab Talk Can't Quit With Lindsay Lohan: Similarly, where discussion related to "rehab" was concerned, it was mostly inseparable from the trials of Lindsay Lohan. Then again, the discussion over rehabilitation programs was hardly monolithic. A much broader discussion ensued across blogs of every variety about whether rehab programs actually work. Many bloggers shared first hand experiences. I couldn't ignore this "Unlocking the iPhone" video because it spikes to the top of the blog charts with unusual fury. Classic CGM!